t is especially gratifying to be able to present the following experiences by the festival teachers, trainees, parents and students. It brought back a lot of great memories. If you would like to contribute to the list you are welcome. Send your comments to me and I will post them. Also, you may notice that there are not a significant number of pictures of the children. If you have a gem or two please send them along to me. I would love to post them as space permits. Many of the photos on this page were taken by our festival photographer, Stephan Hörold. High resolution photos are now available for purchase. 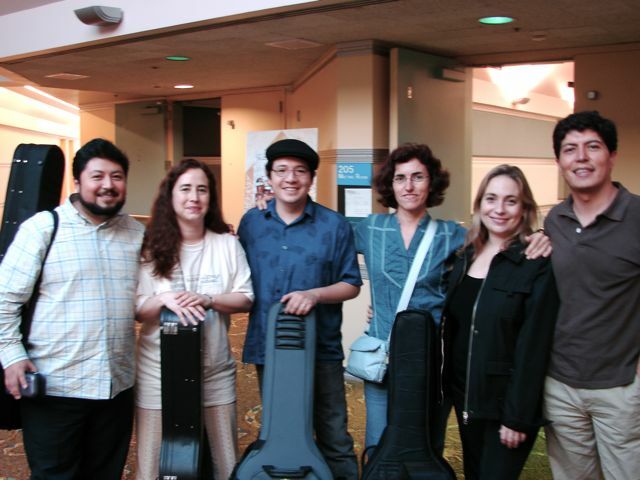 The photos can be viewed at : International Suzuki Guitar Festival 2008 : photos. Information on how to purchase digital or printed photos is also available on the page. I would like to express my deepest appreciation for all of you who brought so much to this great event. It is an honor to be a part of such an extraordinary community of teachers, parents and children. “It was my pleasure to participate in the International Suzuki Guitar Festival put together by the Longay Conservatory in Santa Clara, California, this past July. I met dedicated and enthusiastic instructors from around the world, including Sweden, New Zealand and Mexico, and I had the opportunity to work with some very talented young students in my master class. I was very touched by the reception at my recital, which was met with warm appreciation. I remember looking up at the audience, and being amazed at how attentive and quiet the seven and eight–year–old students were! 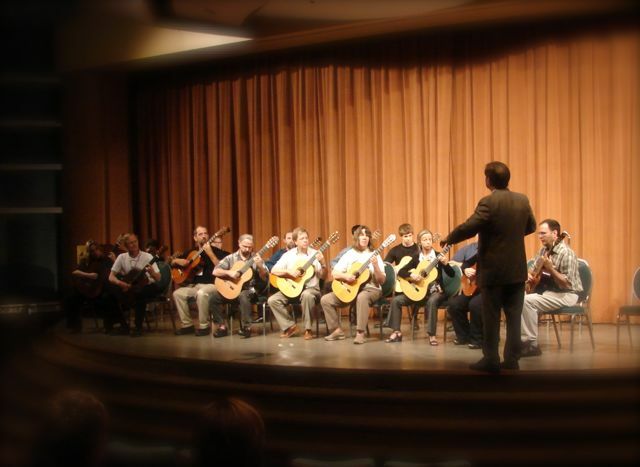 It gives me great hope for the future of the classical guitar to see new players and audiences being nurtured so well. Faculty and students perform Recuerdos de la Alhambra. 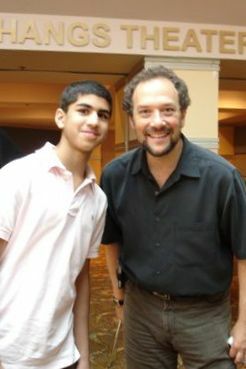 “You are about to start another year of guitar study and I am very excited to share with you and your children what I experienced at the International Suzuki Guitar Festival (ISGF). The festival and Suzuki institute was in Santa Clara, California, where Frank Longay has his conservatory of guitar. Frank is one of the founders of the Suzuki Guitar School and I did my second part of the book 1 training with him in Dallas in 1990. He has come to Little Rock to work with my students, but I think that that was before your children started lessons. Actually, if it weren¹t for him calling me up last May and convincing me to go to the ISGF, I would have missed one of the most profound experiences of my teaching career. “In the true spirit of Dr. Suzuki¹s concept: environment being most important for learning, the ISGF was a complete immersion of guitar music and Suzuki philosophy. It was definitely a positive environment where I was able to learn and be inspired. You might think that after having been around some of the world’s best Suzuki guitar teachers and attending the concerts of two of the world¹s best guitarists, William Kanengiser and Celso Machado, and listening to the Hart School of Music Guitar Orchestra, and young students playing advanced classical guitar pieces, that at age 51, I would have simply thrown up my hands and begun planning for an early retirement. How could I reach such a high level of playing and teaching my self? This is impossible! Oh yes it is! Remember that Suzuki quote, ‘Ability equals knowledge plus 10,000 times.’ After listening to the key note address titled ‘Sympathetic Resonance – The Magic of the Suzuki Community’ given by Zeah Riordan from Australia, I realize that I have another important theme to take back home to all of you in Little Rock. The teaching I have done here in Little Rock and what you and your children have achieved in these past years is awesome and is an excellent contribution to the greater Suzuki guitar community. Dr. Suzuki wanted families to be part of a community. He fostered cooperation, not competition. After attending the festival, I feel more confident about my own playing and teaching. I am more motivated and less intimidated to keep on teaching and learning the classical guitar. Dear parents and students in Little Rock, we are part of this wonderful Suzuki community. You may not know it, but by me taking the Book 5 professional development with such an inspiring teacher as Dave Madsen and receiving some private guitar instruction with Rob Watson, I hope that you will take your child to a Suzuki Institute. The most important lesson review point that I take home to you all came from listening to Ayush Midha ( I think he is 10) play the Gavotta–Choro from the Suite Populaire Bresilienne. His performance was the ‘living soul’ that Suzuki writes about. I heard beautiful music, but I witnessed a wonderful human being. School’s Concert performers: Hartt School. “Overall, my son, Frankie and I really enjoyed the festival. Meeting Frank Longay was the highlight of the trip. We have shown the photo of the two Franks to everyone. The teachers were exceptional. The concerts we attended were fun, especially Celso. “Diana¹s class was Frankie¹s favorite. It was extremely cool that Diana¹s first language was not English and that there were interpreters for them. Could it have been more international?! He had to watch her very carefully to understand what she was teaching, and he did. He really appreciated the stickers she handed out for good work. And now he understands what I mean when I say, “Lento, lento.” Diana did a great job of getting him to think less of notes, and more of music. She helped correct his hand positions for some chords which we have been trying to fix for a while. She focused his attention on how to express the beauty of the pieces he played. “MaryLou rocked! 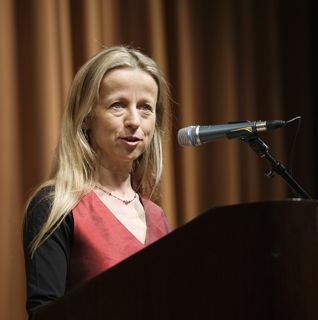 She was one of the fastest thinking teachers I have ever seen. As she looked around the room, spotted kids needing correction, and offered very patiently worded questions or suggestions in a matter of seconds. They were a challenging group of kids at different social/developmental levels. She did a superb job of getting them to play together. I especially liked how she included everyone whether they could play the pieces yet, or not. It didn¹t look like anyone felt left out. She played games, danced, did tricks to get them to understand ideas w/o them even realizing they were learning music theory. She gained their cooperation so seemingly effortlessly that I could tell she has had a lot of experience. “We loved Emily! Patient, very enthusiastic and knowledgeable, I also took the parent yoga class, and find myself automatically doing the breathing when I am under stress. Frankie remembers a lot of what she taught, and we have demonstrated our yoga to his sister and his friends. Joaquin Olivaris, Mexico City, Mexico. “The kids were delighted by the unexpected sounds and engaging music of Celso Machado. We also found the student concerts inspirational, especially watching the older kids play. For weeks afterward Alexander was humming the tune of Nonesuch, even though we're only on Book 1. 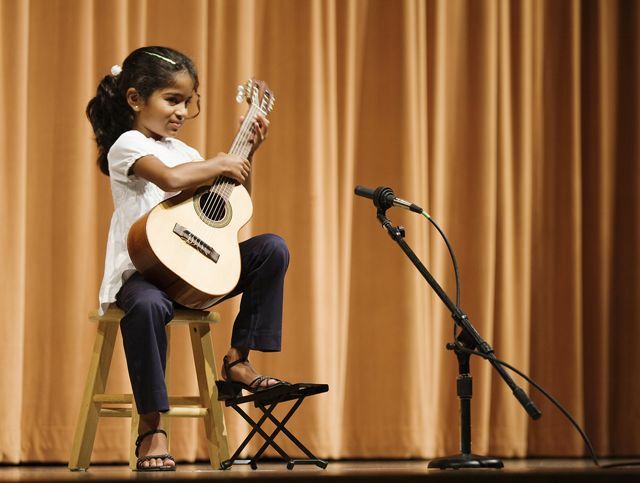 It takes many years of dedication, and I really admire the students, parents and teachers who are so committed to Suzuki guitar. “I also found it refreshing to have a chance to chat with other parents and look forward to continuing this dialogue. I would love to see an online forum for Longay parents to share common concerns and advice and to build a supportive community. (We've had a glimpse of what to aspire to; now how to get there is another matter altogether, requiring all the guidance one can get.... I wish I had the chance to attend more of the parent talks/lectures, but unfortunately some coincided with the master class. I did get a chance to hear Michele's parent talk and found her tips very useful — she has kindly emailed her notes to me and given permission to share them with other parents who couldn't attend. “Becca was a participant in my Guitar Orchestra, a beginning–level class that included students who had some prior ensemble experience as well as those playing in a group of this type for the first time. I knew Becca and her mom from Suzuki institutes in their home state of Colorado, and it was good to meet up with them at the Festival. Becca¹s teacher at home, Joe Beninghof, had done an excellent job of preparing her for the ensemble, but there was one spot in one piece that was giving her trouble. I was pleased that Becca¹s mom felt comfortable in asking me for some guidance, so we set up a date for a working lunch. We managed to sandwich, pardon the expression, small steps and many repetitions between bites of tuna fish and bagels with peanut butter, and Becca¹s confidence seemed to grow with her new ability. “I have a treasure chest of memories of the recent International Festival of Suzuki Guitar held in California. It is best summarized in two words: music and friendship. These two elements choreographed a wonderful dance through the week of classes, concerts, and special events. I was honored to be invited to teach at this event. So much care, and thought went into the planning of the Festival and it was reflected in the high quality of the experiences offered. 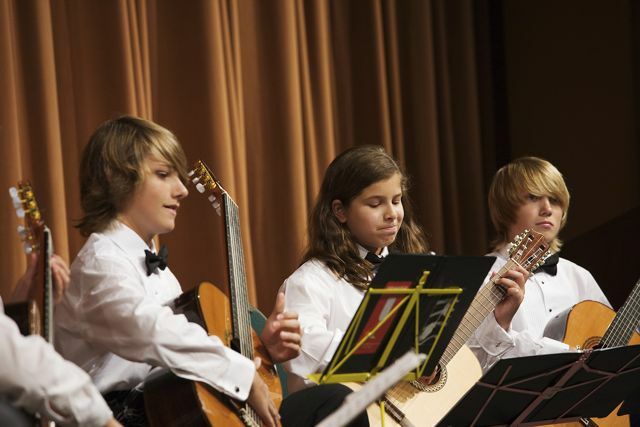 Students had a diverse range of musical offerings, and a unique opportunity to go deeply into their playing. What stood out for me during the week? I had so much fun working with children of all levels, experiencing directly how the Suzuki repertoire links our worldwide community. I resonate so strongly with my teacher colleagues – spending time together nurturing our common vision was deeply enriching. Sitting one morning playing guitar with New Zealand teacher colleagues and an American student — just for the fun of it. The generosity of so many — Kim and Frank took such care through the week so that families and teachers had a memorable experience. Brazilian guitarist, Celso Machado continued making music in every break between classes: sharing, showing, and creating — wow! His concert was a true highlight — my smile muscles were tired because I simply could not wipe the smile from my face — his music making was so joyous! Celso Machado leading a Brazilian drumming class. Gala Concert featuring 100 guitarists from 9 countries!